Cleansing, Restoring and Relaxing Group Healing with Sacred Sound, Consciousness Energy Work and Techniques for Personal Empowerment. all the while getting your body healed, balanced and your chakras cleared through sound and energy! we will also get to ‘clean up’ your mind: your limiting beliefs, traumatic past history or anything negative you believe about yourself or the world! And whatever other magical information and energies and sound the Universe has for us to play with! Investment: An Introductory Special Rate to East West Organics Clinic $15 per person only! Date & Time: 24 July, 6:30 p.m. – 8 p.m.
Sound can be used to experience deep levels of healing by tuning your body back to its fundamental healthy Life frequency, to your true rhythm. 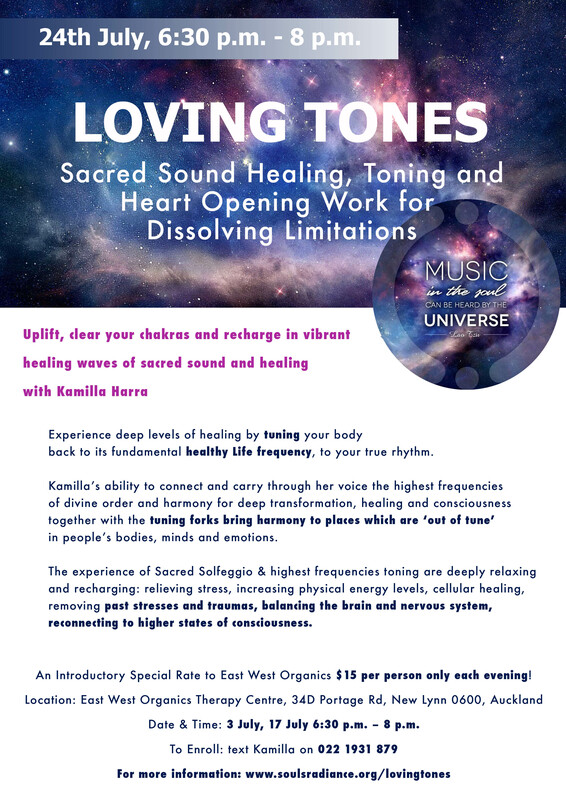 Kamilla’s ability to connect and carry through her voice the highest frequencies of divine order and harmony for deep transformation, healing and consciousness together with the tuning forks bring harmony to places which are ‘out of tune’ in people’s bodies, minds and emotions. The experience of Sacred Solfeggio & highest frequencies toning are deeply relaxing and recharging: relieving stress, increasing physical energy levels, cellular healing, removing past stresses and traumas, balancing the brain and nervous system, reconnecting to higher states of consciousness. “I attended a sacred sound workshop that Kamilla was facilitating. It was a very powerful and healing experience, the cells of my body literally buzzed with delight after the workshop! I then invited Kamilla to host a similar workshop at my healing centre and it too was very powerful, healing and energizing. If you get the chance I would definitely encourage you to try out any similar workshops Kamilla facilitates, in my opinion, you will not be disappointed.” Shane Pearson, Mullingar, Ireland.